With the Terror Law Proclamation of 2009, which declared three Ethiopian opposition Political groups- namely the Oromo Liberation Front (OLF), the Ogaden National Liberation Front (ONLF) and Ginbit-7 “terrorists”, remaining in effect despite pleas from numerous national and international human rights organizations, the Ethiopian government continued cracking down on whoever protests against its repressive rules. The Proclamation fully contradicts the whole catalogue of human and legal rights stipulated in the Ethiopian Constitution. Citizens have no freedom to express their views or meet in public, and whoever dares to defy the Proclamation is charged with being a terrorist or affiliated with a terror group, subsequent to which s/he is thrown into jail without the right to bail. As a result, the numbers of political prisoners held in Ethiopian prisons and makeshift sites have reached an unprecedented level, forcing the government to starve other sectors of the economy in order to build new prisons. The number of political prisoners in the country remains secret as the government denies holding any, even though a few weeks back and under pressure from the public, it declared that it would soon release all political prisoners. The promise, however, was not kept as it released only 153 prisoners out of the thousands held in federal government prisons. Prominent opposition party leaders like BekeleGerba, AndargachewTsigie and journalists like EskendirNegahave remained imprisoned. The judiciary remains as dependent as ever and Court rulings are far from being fair. In most cases, the judges were given orders by authorities in the ruling party to sentence alleged political figures to a certain number of years, although it is evident that the charges were fabricated. In cases where some independent judges dared to release political prisoners on bail, as happened with the case of Mr. BekeleGerba, it was the prison officials, with a link to the ruling party officials, who defied the court ruling and kept the prisoner. At the time of this writing and for almost a year now, Mr. Gerbastill languishes in prison not knowing what the future may hold for him. Some political prisoners who were on the list of those to be released from prisons following the announcement by the government were kept behind, and brought to court where they were sentenced for violations of the norms of the Proclamation on Terror. This is just one indication that the Ethiopian judiciary is completely under the control of the government. The government is targeting the non-EPRDF member citizens in general, and the youth in particular, who have been fighting for equality and justice for almost a decade now. The citizens, however, have continued with their peaceful uprising for an unprecedented three years in a row since November 2015, unifying the people of all ages and from all corners. During these three years of continuous protests, over 4,000 citizens have been killed, thousands others injured, and unknown numbers forcefully disappeared. The civilian police and the military killed over 700 Oromos on October 2, 2016 alone during the celebration of Irrecha, the Oromo Thanksgiving festival. After all these cruel actions of the government, the Oromo people didn’t give up their demands for equality and justice and continued their peaceful protests. Unable to suppress the uprising, the government declared-on October 8, 2016-a six- month state of emergency which de jure suspended all constitutional rights. With a pretext of participating in protests, over 70,000 Oromos were thrown into prison and military camps and kept in inhumane and degrading conditions. Some 30,000 were released, but many Oromos remain detained in unknown locations and without official charges. Although the government officially admitted that the mass uprising was the result of failure on its part to deliver good governance, it continued arresting and killing civilian demonstrators and ignoring their legitimate demands for equality and justice. It is reported that during the 2017 civilian demonstrations alone in Oromia and Amhara regions, more than 1,000 persons were killed. Since the beginning of 2018, the security forces killed nearly 100 persons during demonstrations in these two regions. The killings, beatings and imprisoning of the citizens in Ethiopia didn’t stop them from demanding equality, justice and freedom. To silence the grievance of the citizens by military force, the government created on November 12, 2017 the so- called “National Security Council” led by the Defense Minister who declared de facto military rule. Following the decision, the government deployed its military force into the Oromo and Amhara Regional States to effect repression. The National Security Council- which is led by the Defense Minister SirajFegessa- has controlled the regional states’ police and security activities, paralyzing regional police and security institutions, in violation of article 39(3) of the Ethiopian constitution of 1995 which stipulated that “Every Nation, Nationality and People in Ethiopia has the right to a full measure of self-government which includes the right to establish institutions of government in the territory that it inhabits and to equitable representation in state and Federal governments”. The Federal government, in its attempt to engage the different ethnic groups (nations and nationalities) against each other and rule them as divided entities, encouraged the Somali Regional government to declare an outright war against the adjacent Oromo people as a result of which nearly one million Oromos were forced to leave their homes and villages. The government, although admitting for the first time in its history that Internally Displaced Persons (IDPs) existed on its territory, deprived the displaced of the right to access food, shelter and water by blocking access roads as well as making them unsafe for humanitarian relief workers. 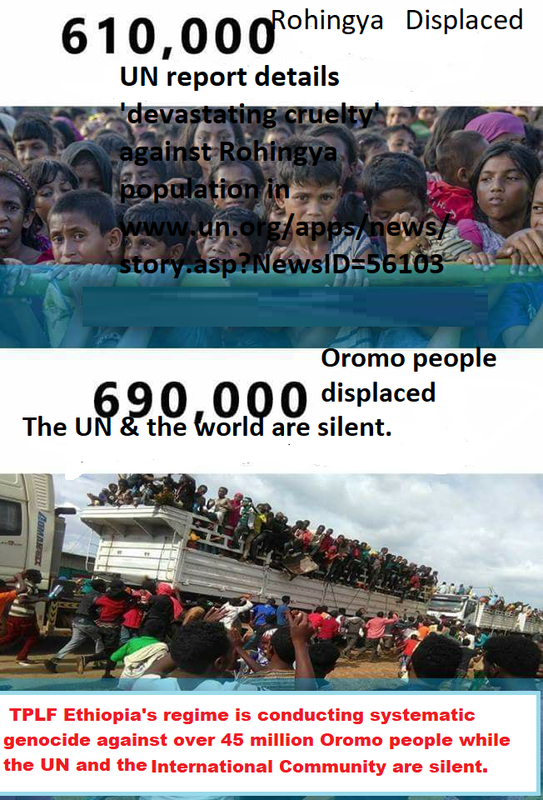 As a result, the million displaced people had to seek permanent settlement in other parts of Oromia, with the help of Oromo Nation and regional authorities without the involvement of the Federal government. Conditions in Ethiopian prisons remain the same as we last reported in 2017 at the UN Human Rights Council 34th Session. Political prisoners have the right to a reasonable space/room for sleeping, access to daylights, to proper sanitation and family visits as well as meeting with their respective lawyers. In one of the worst correctional facilities in the world, none of these have been afforded. The level of torture, as reported by those who were recently released from these prisons, is simply unbearable. The government continues denying access to international human rights organizations, the UN Human Rights Special Rapporteurs and the ICRC, whose report could have shed more light on the situations in the prisons. The economic situation in the country is going from bad to worse. With the “developmental state economic policy” of the government, the few at the top amassed the entire wealth of the nation leaving the population in abject poverty. Graduates of the various universities can hardly find jobs in the country, and as and when they take their frustration to the streets, the security forces are meeting them with live bullets. All in all, the security situation and the physical safety of the youth in the country remain un-secured, resulting in a mass exodus of the entire young generation who is leaving illegally in search of a better life elsewhere. In doing so, hundreds are being drowned in the Red Sea or the Mediterranean, while some others end up being hostages of human traffickers and organ collectors in the Sinai or the Sahara. Young girls are lured into the criminal world and remain exploited by human traffickers in Middle Eastern countries. The HRLHA once again renews its calls to the international community to act collectively in a timely and decisive manner – through all available mechanisms of the United Nations in accordance with the UN charter to stop the Ethiopian government’s assaults on its own citizens before it is too late. Based on the 2005 World Summit Outcome Document Paragraphs 138 and 139 on the Responsibility to Protect (R2P), the international community has the responsibility and the mandate to use appropriate actions, diplomatic, humanitarian and other available means to protect the people who are only demanding their fundamental human rights as recognized by the United Nations. It is not a new practice of the United Nations that when States violate the terms of the social contract they have with their own population, it has always been the responsibility of the international community to step in and save the defenseless civilians from being exterminated, as is the case now in Ethiopia. When the State is unable or unwilling to protect its population from genocide, war crimes, crimes against humanity and ethnic cleansing, the international community has the responsibility to intervene. Ethiopia faces a high risk of failure due to continued political and social instability in the country, the Fund for Peace reported in its Fragile States Index Annual Report 2017. Over the past few years, months, weeks and days, security officers have killed anti-government protesters, resulting in more anti-government protests. The latest point in this vicious cycle occurred on January 20 when Ethiopian security forces shot and killed at least seven protesters. According to news reports, the protesters were celebrating a religious festival. Then they started chanting anti-government slogans and hurling stones at security officers, who responded by firing bullets. Reports say the weekend clash was followed by a week of more violent clashes, which resulted in the death of at least 20 civilians. Much of this bloodshed in Ethiopia is based on ethnic differences and territorial disputes between ethnic regions within the nation. Activists say that more than 700 Oromia residents were killed when security officers clashed with people from the Oromo ethnic group during a thanksgiving festival in October 2016. A similar incident happened in October last year when security forces killed about 10 people who were protesting food shortages. In December, military officials reportedly killed 15 protesters in Oromia. “Ethiopia’s overall Fragile States Index (fsi) score has been incrementally worsening over the past decade, moving from 95.3 in 2007, to a score of 101.1 in [last] year’s 2017 index, with Ethiopia—along with Mexico—being the most-worsened country over ,” wrote the Fund for Peace. Foreign Policy wrote on January 11 that “Ethiopia Is Falling Apart.” Click here to read more…. Local media portals are reporting violent protests in Ethiopia’s northern Amhara region. The protest in the town of Kobo is against an earlier deadly crackdown that killed seven people in the town of Woldiya last Sunday. The Addis Standard and Addis Gazetta portals report that the clashes started on Wednesday leading to the burning of government offices and other public properties. The heavy military presence in the region and the sound of gunshots suggest that live bullets are being discharged. There are no official casualties reported from the incident even though journalists said three people have been killed. Public protest and deadly crackdown undergoing in Kobbo, north east of Amhara, undergoing. Reports are coming out that Fed forces are using live ammunition against unarmed protestors. The earlier protest which resulted in the Kobo round of protests was in Woldiya during the Epiphany celebrations, according to the United Nations human rights office, the military fired live bullets to prevent young people from chanting anti-government slogans. Seven people are said to have died whiles dozens got injured in the ensuing clashes. Kobo is located about 50 km from Woldiya. Amhara along with Oromia region were the main centers of anti-government protest that shook the country in 2015 and through the better part of 2016. To quell the violent protests, Addis Ababa imposed a nationwide state-of-emergency in October 2016. The measure was lifted in August 2017. Parts of the country have been rocked by deadly protests since the measure was lifted. ESAT: One of the thirteen people shot and killed by TPLF security forces on Epiphany day religious festival in Woldia, a town on a major transportation route in Northern Ethiopia, was shot five times. Students in Oromia held a candlelight vigil in remembrance of the Oromos slain in Ambo on October 26, 2017. The killings of at least 10 Oromos came after the Ethiopia’s Woyane military invaded Ambo over an incident involving the fair distribution of sugar in Ambo and the surrounding region. Here are some photos from the event; we’ll bring you more photos of similar events in the future. Addis Abeba, September 08/2017 – Residents of Ethiopia’s Moyale town, 795 km south of Addis Abeba, in Guji zone, Borena, say both local and regional government officials have “failed us repeatedly” in the face of renewed border incursions followed by attacks by what they described were members of the “Liyu Police”, a special paramilitary force operating within the Ethiopian Somali regional state. 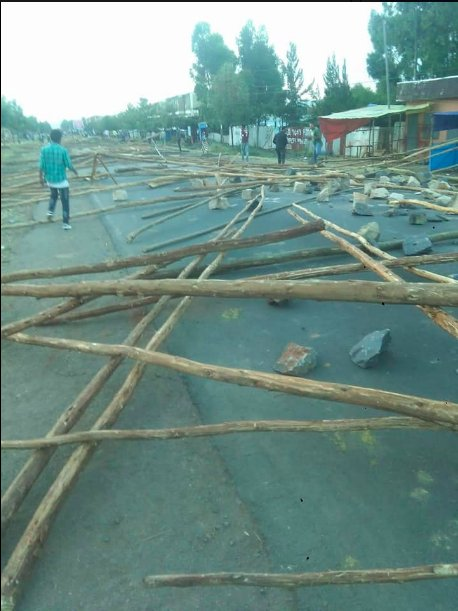 The complaint from residents who talked to Addis Standard came following yesterday’s bloody fighting between the locals and what Addisu Arega, head of communications affairs bureau of the Oromia regional state, said were “armed men who crossed over to the border from the Ethiopian Somali regional state”. Several people were reported to have been killed during the daylong fighting in Chamuqi woreda in the town of Moyale and its environs. Addisu told DW Amharic that yesterday’s fighting was a “serious conflict” and that causalities were reported, but he said the regional state was not able to verify the number of causalities and the extent of the damage as of yet due to the “ongoing conflict”. 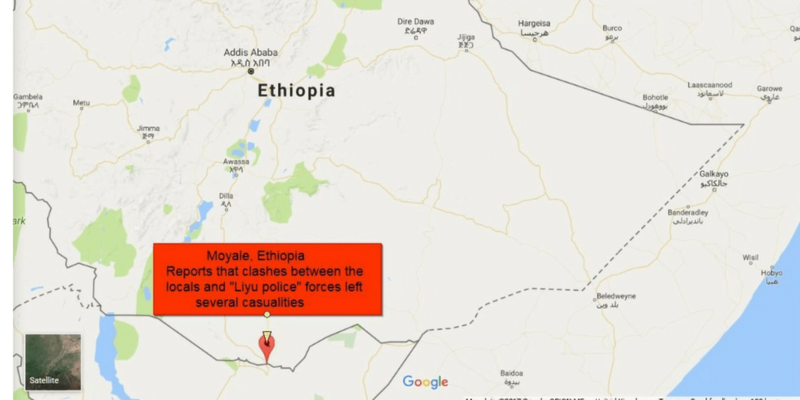 Dube Qajelcha, a resident of Moyale town, told Addis Standard that several accounts from the people around put the number of causalities both from the members of the “Liyu Police” and the locals to more than 30. “Most of the causalities are from the members of the “Liyu police” who were met with resistance from the locals when they crossed to the Chamuqi village,” Dube said. According to Addisu, the Somali regional state administration had in the past began a project in Chamuqi woreda, which is under the administrative boundaries of the Oromia regional state, but had to stop following negotiations. But armed men from the Somali regional state returned back and tried to waive the Somali regional state’s flag. Several bodies of dead military men and civilians have littered Oromo social media activists throughout yesterday. And in late afternoon similar conflict erupted in Rayitu Gelbi woreda of Bale zone, south east Ethiopia. 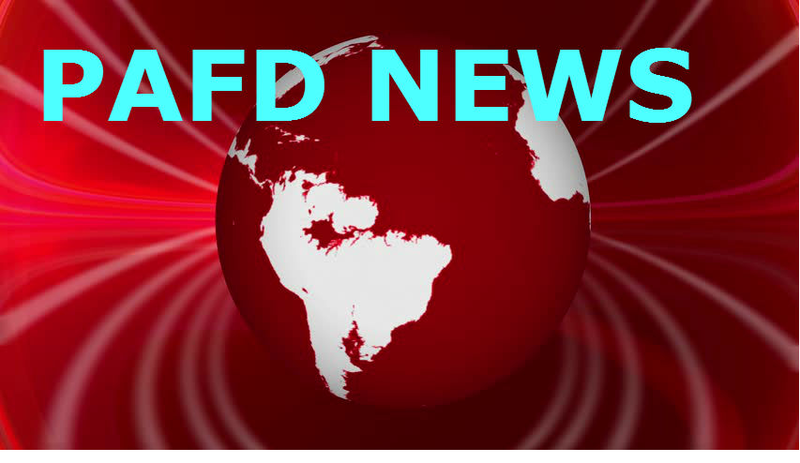 According to DW Amharic at least four people were killed in yesterday fighting and the federal army reserve from Ginir, Bale, were seen mobilizing toward the area, DW said quoting eye witnesses. However, reports indicate the conflict is still ongoing. The incident is not an isolated one; it is an extension of a growing tension related to border and resource issues between the two regional states but one that is exacerbated by the persistent raid by the members of the “Liyu Police” into towns and villages of areas under the administrative border of the Oromia regional state. The “Liyu police” is a special police force established in April 2007 following an attack by the Ogaden National Liberation Front (ONLF) rebel group on a Chinese oil exploration that killed 74 Ethiopians and nine Chinese workers. However, since its establishment the paramilitary force is repeatedly accused of committing atrocious crimes against civilians with pure impunity. 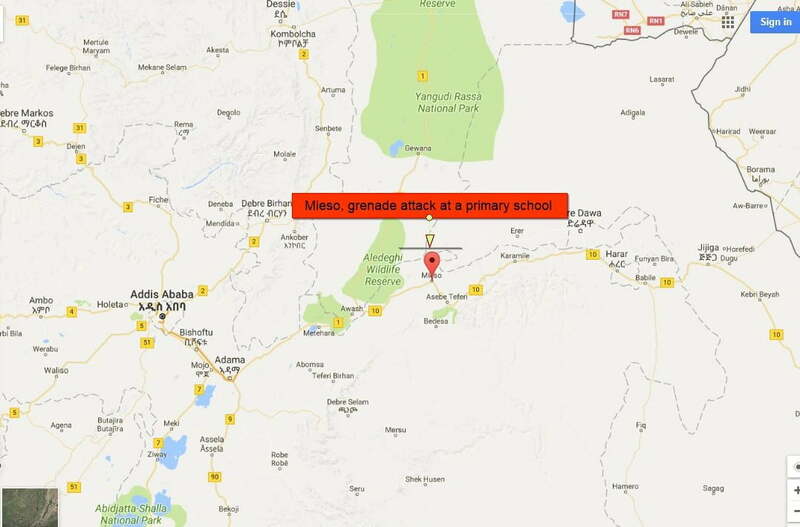 On Tuesday this week, Addisu Arega reported that four children were hurt when a hand grenade went off in in Mieso town eastern Ethiopia. He posted another report on the same day saying armed men who crossed from the Somali regional state have opened fire against civilians in the same town and have wounded two people. On Friday last week another intense fighting between the Ethiopian Somali and the Oromo ethnic groups in the same town and its environs has left “more than 30 people”, including “more than a dozen army members”, dead and several others injured, Addis Standard reported. Posted by OromianEconomist in #ABCDeebisaa, #OromoProtests, #SidamaProtests. 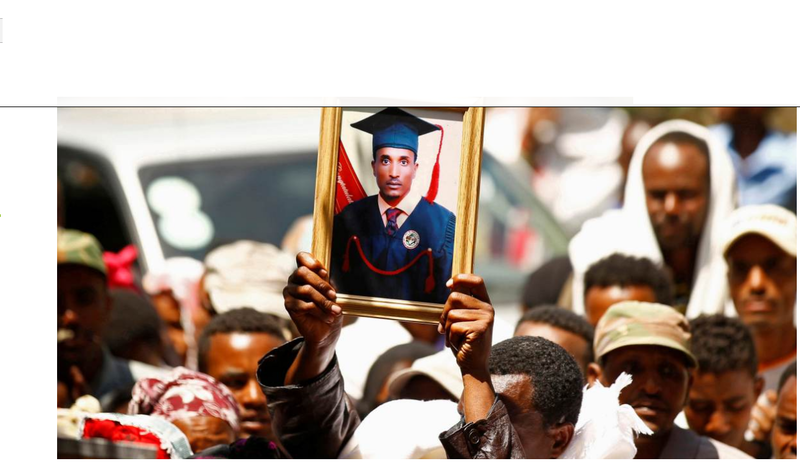 LONDON, June 29 (Thomson Reuters Foundation) – It was late 2015 when Endalk Chala began documenting deaths in his home country of Ethiopia, scouring Facebook, Twitter, and blogs to piece together who had died and where. A government report presented to parliament in April acknowledged a death toll 669 people – 33 of them security personnel – although activists believe it could be much higher. In its report of 669 deaths presented to parliament, the Ethiopian Human Rights Commission – which works for the government – blamed protesters for damaging land and property. However the United Nations High Commissioner for Human Rights, Zeid Ra’ad Al Hussein, criticised the government for a lack of accountability and called for access to protest sites. “Any time victims of human rights abuses share information with outside groups, with journalists – either domestic or international – there’s often repercussions, quite often from local security officials,” he said. This is part of our series “The Politics of Death”, reporting a global wave of violence against communities fighting for their lands. To find out why, read the full story here. Tags: #OromoProtests, Africa, Down Down Wayane TPLF, Ethiopia’s secret genocide, Fascist TPLF Ethiopia, Genocide, Genocide Against Oromo People, Oromia, Oromo, TPLF, Why do the Oromo Resist the Finfinnee (Addis Ababa) Master Plan? Why EPRDF opted for a policy of Mutual self-annihilation on Addis Ababa ? In a tragedy akin to the Treaty of Wichale of May 2, 1889, the Ethiopian federal government is repudiating the self-governance rights of the Oromo people of themselves and their territory by trying to separate Addis Ababa from Oromia. This is very problematic and evil by design which will undermine social harmony and peaceful coexistence among Ethiopians, and maybe even might lead to Ethiopia’s disintegration as a nation. The issue is very simple for every living human being to understand. If Oromo lands where other Ethiopian ethnic groups settle in large number and live are snatched and taken away from the Oromo people under the pretext of Oromos have become minority in their own city or land or Oromos cannot govern other Ethiopian ethnic groups (which comes only out of the heart of a group who has extreme hatred and disrespect for the Oromo people), then, why on Earth will the Oromos allow for other ethnic groups to come and live among them in the first place? This malicious and evil policy driven by shortsighted land grab agenda by few will force the Oromo people to adopt xenophobic attitude or not to allow anymore for other Ethiopian ethnic groups to live anywhere among the Oromo people. That is natural human instinct particularly when it is clear that the policy is not to live together with the Oromo people but to slowly take Oromo people’s land by eliminating the Oromo. This is not nuclear science. All Ethiopians who really care about Ethiopia and harmony among Ethiopians should just close their eyes for a minute and think about it. It is a nightmarish situation. I don’t understand why EPRDF is doing this against the Oromo people and the Ethiopian people unless the intention is something evil and sinister. I strongly advise EPRDF and the Ethiopian government to immediately restore the status of Addis Ababa as one of the Oromia cities under Oromia jurisdiction, and decide upon the special interest of the federal government in Addis Ababa. Imagine what will happen if the same situation is contemplated on Gonder, Bahir Dar, Mekele or Awassa? 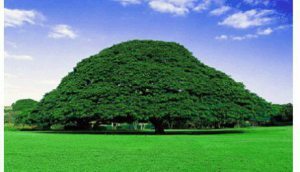 Will the Amhara or Tigray people sit idle? How long could the EPRDF continue disrespecting the Oromo people and for what end?! If the EPRDF as a group thinks the Oromo people will not assert their rights in their own country and on their own land? 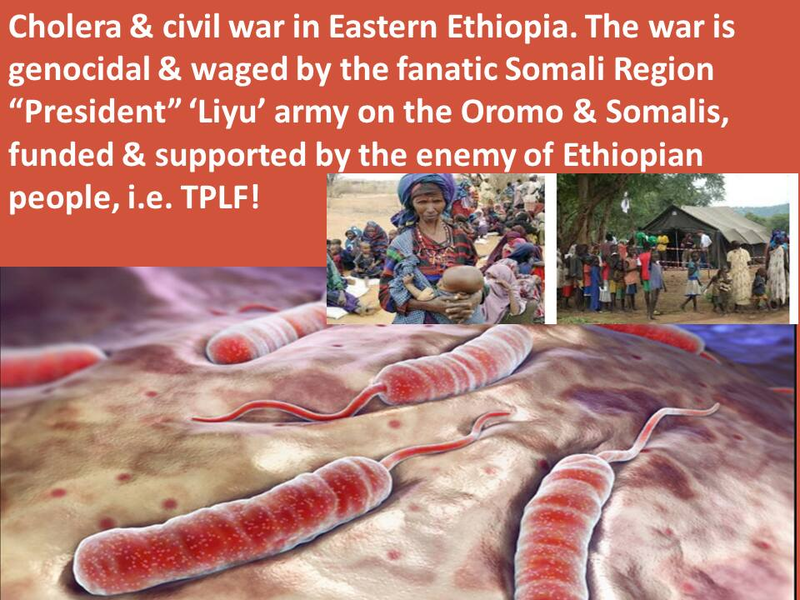 Then, the EPRDF has little understanding of the Oromo people and the Ethiopian history! I don’t know why this policy of mutual self-destruction become a top priority for the EPRDF when there are many other policy options available to it? In Ethiopia, a state of emergency has been in place since October, following a year of protests where around 1000 were killed by security forces, tens of thousands detained, and key opposition figures charged under the antiterrorism law. Restrictions have resulted in a cessation of protests for now, providing a window of opportunity for the government, but there is little sign that they are moving to implement human rights reforms. Ethiopia has ignored repeated calls for international investigations, saying it can investigate itself, but recent investigations by the Human Rights Commission have not met even the most basic standards of impartiality, underlining the need for an international investigation. As called for by 262 Congolese and 9 international NGOs ahead of this session, it is critical that the Council immediately launch a Commission of Inquiry into violations committed in Congo’s Kasai region, providing it with the independence, resources and expertise needed to document abuses, identify those responsible, and ensure justice for victims. Turkey’s new political system has centralized enormous power in the president without the checks and balances fundamental to rule of law in a democracy. The referendum introducing it took place in a repressive climate under a state of emergency in place since the failed July 2016 coup. Emergency decrees resulted in the summary dismissal of more than 100,000 civil servants, of whom 50,000 are jailed pending trial. Today, Turkey is the world leader in jailing journalists – over 150 since last July – and charging them with terrorist offenses. They have also jailed leaders and members of parliament from the pro-Kurdish parliamentary opposition – and only yesterday a parliamentarian from the main opposition party – and repeatedly threatened to reintroduce the death penalty. Finally, we are deeply disappointed that, in our understanding, Greecewas not willing to support an appropriately strong expression of concern at the deteriorating human rights situation in China, a situation that warrants serious attention by this Council, denying the EU the opportunity to address country concerns under item 4 with one voice, for the first time since the institution-building text was adopted ten years ago. The International Criminal Court (ICCt) announced on 15 September 2016 it will now hold corporate executives and governments legally responsible for environmental crimes. The court’s new focus on land grabbing and environmental destruction could help put a dent in corporate and governmentalimpunity. Politicians and corporate bosses who are chasing communities off their land and trashing the environment will find themselves standing trial in the Hague alongside war criminals and dictators. However, far‐sighted covers by USAmerican corporate investors through corporate fronts from e.g. India restrict the ICCt, since neither the USA nor India ‐ as other rogue states like Sudan or Israel ‐ are parties to the Rome Statute of the ICCt. Ethiopian forces from the command post of Ethiopia’s sweeping State Of Emergency command post detained leading Oromo ethnic group and government opposition figure Prof. Dr. Merera Gudina, chairman of the Oromo Federalist Congress (OFC), upon his arrival at Addis Ababa Bole International Airport after returning from Brussels, where he testified at the EU parliament on the current situation in Ethiopia alongside with Prof. Berhanu Nega of Patriotic Ginbot 7 (G7), an armed freedom fighter group, and Rio Olympics marathon silver medallist ‐ athlete Feyisa Lellisa. Also four relatives of Prof. Merera were detained. Oromo asylum seeker and UNHCR registered refugee Yaazoo Kabbabaa ‐ the prominent leader of ‘Qeerro‘ (The Oromo youth group who is leading the protests in Ethiopia) ‐ was attacked in Cairo during the evening while he was returning home from visiting friends, by people described as Ethiopian state agents following him. During the incident Mr. Kabbabaa was injected in the neck with a toxic substance. Luckily he was rescued and brought to a hospital, where he regained consciousness in the meantime. It is, however, not yet clear if he will remain paralyzed. His medical bills are being covered by a campaign: https://www.gofundme.com/yaazoo‐kabbabaas‐medical‐fund . Please chip in! Ethiopian dissidents who fled the country live in constant fear from agents sent by the Addis regime after them. As we predicted: The brutal regime felt empowered by Merkel’s visit and the promised millions of Euro for “police training” and “to try to quell the unrest”. In just the one week after her ill‐conceived visit almost 3,000 Oromo women and men were rounded up in different locations and thrown in jail. Reportedly Ethiopian agents were sent to neighbouring countries to hunt down dissidents. Ethiopian authorities admitted to Reuters on Thursday they had detained 1,645 people. * 11. Oct. 2016: German Chancellor Angela Merkel travelled to the Ethiopian capital of Addis Ababa, where she was welcomed by the PM of the corrupt regime with military honours. Amid protests in Germany against the insensitive visit, Merkel offered millions of Euro in bilateral agreements, to train the police and mediation to try and quell the rising unrest in Ethiopia. Just two days prior to Merkel’s visit, the Ethiopian regime declared a six‐month state of emergency in order to undertake even more brutal measures to suppress popular protests. * 02. Oct. 2016: At least 52 people directly killed by police action against protesters during Oromia religious festival of Irreechaa, the Oromo Thanksgiving, in Bishooftuu. Others died in the ensuing stampede. 175 dead bodies have been loaded and taken to Addis Ababa according to a police source. That’s in addition to over 120 at Bishoftu hospital. ECOTERRA Intl., Human Rights Watch and the UN called for an independent investigation. * 01. Oct. 2016: ECOTERRA Intl. demands the immediate and unconditional release of illegally arrested Ethiopian scientist and blogger Seyoum Teshome. Police arrested the prominent writer and commentator Teshome today, who writes for http://www.Ethiothinkthank.com and lectures at Ambo University. * 16. 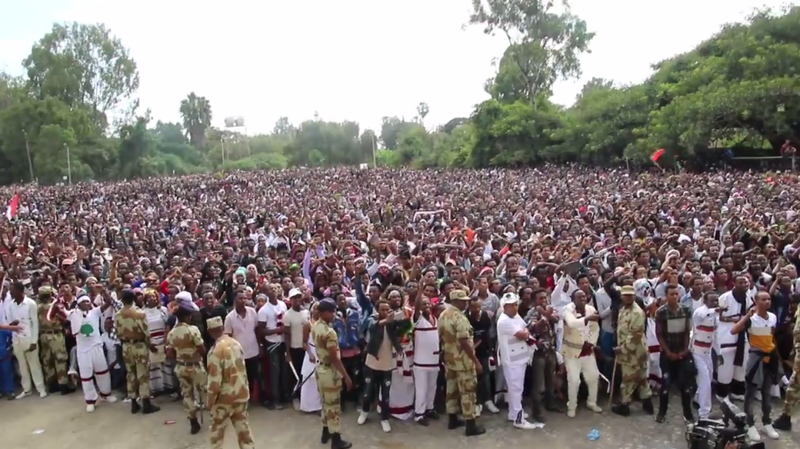 June 2016: Ethiopian security forces killed at least 500 people in the recent wave of anti‐government demonstrations, US‐based Human Rights Watch (HRW) says in its most comprehensive report into the Oromo protests. Even government officials admitted that over 170 Oromo protesters were killed. Meanwhile the atrocities against the Mursi and other aboriginal nations of Ethiopia continue unabated. Foreign investments through the present Ethiopian governance are unethical and taxpayers all over the world must ensure that their governments, who are state‐sponsors or donors to the Ethiopian governance, stop immediately any support until these crimes against humanity end. Land Grabbing is the purchase and lease of vast tracts of land from poor, developing countries by wealthier nations and international private investors. It has led to unprecedented misery especially in Africa, South‐America and India.African Food Security is in jeopardy and lands half the size of Europe have already been grabbed. The Ethiopian government has forcibly displaced hundreds of thousands of indigenous people from their ancestral lands. It has rendered formerly sustainably living small‐scale farmers and pastoral communities dependent on food aid, which is paid for by the taxpayers and well‐wishers from donor countries, while the profits of these industrial agriculture‐, oil‐ and gas‐ventures go into the pockets of private investors and corrupt officials. The recently enacted Kampala Convention ‐ an Africa‐wide treaty and the world’s first that protects people displaced within their own countries by violence, natural disasters or large‐scale development projects ‐ is violated blatantly and with impunity by Ethiopia. The African Union Convention for the Protection and Assistance of Internally Displaced Persons in Africa must be enforced! Ethiopia’s leasing of 600,000 hectares (1.5m acres) of prime farmland to Indian companies has led to intimidation, repression, detentions, rapes, beatings, environmental destruction, and the imprisonment of journalists and political objectors, according to a new report. Research by the US‐based Oakland Institute suggests many thousands of Ethiopians are in the process of being relocated or have fled to neighbouring countries after their traditional land has been handed to foreign investors without their consent. The situation is likely to deteriorate further as companies start to gear up their operations and the government pursues plans to lease as much as 15% of the land in some regions, says Oakland. In a flurry of new reports about global “land grabbing” this week, Oxfam said on Thursday that investors were deliberately targeting the weakest‐governed countries to buy cheap land. The 23 least‐developed countries of the world account for more than half the thousands of recorded deals completed between 2000 and 2011, it said. Deals involving approximately 200m ha of land are believed to have been negotiated, mostly to the advantage of speculators and often to the detriment of communities, in the past few years. In what is thought to be one of the first “south‐south” demonstrations of concern over land deals, this week Ethiopian activists came to Delhi to urge Indian investors and corporations to stop buying land and to actively prevent human rights abuses being committed by the Ethiopian authorities. Ethiopian activists based in UK and Canada warned Indian investors that their money was at risk. “Foreign investors cannot close their eyes. When people are pushed to the edge they will fight back. No group knows this better than the Indians”, said Obang Metho, head of grassroots social justice movement Solidarity Movement for a New Ethiopia (SMNE), which claims 130,000 supporters in Ethiopia and elsewhere. Ochall, who said he was in daily direct contact with communities affected by “land grabbing” across Ethiopia, said the relocations would only add to hunger and conflict. Ethiopia has leased an area the size of France to foreign investors since 2008. Of this, 600,000 ha has been handed on 99‐year leases to 10 large Indian companies. Many smaller companies are believed to have also taken long leases. Indian companies are said to be investing about $5bn in Ethiopian farmland, but little is expected to benefit Ethiopia directly. According to Oakland, the companies have been handed generous tax breaks and incentives as well as some of the cheapest land in the world. The Ethiopian government defended its policies. “Ethiopia needs to develop to fight poverty, increase food supplies and improve livelihoods and is doing so in a sustainable way,” said a spokeswoman for the government in London. She pointed out that 45% of Ethiopia’s 1.14m sq km of land is arable and only 15% is in use. The phenomenon of Indian companies “grabbing” land in Africa is an extension of what has happened in the last 30 years in India itself, said Ashish Kothari, author of a new book on the growing reach of Indian businesses. “In recent years the country has seen a massive transfer of land and natural resources from the rural poor to the wealthy. Around 60 million people have been displaced in India by large scale industrial developments. Around 40% of the people affected have been indigenous peoples,” he said. These include dams, mines, tourist developments, ports, steel plants and massive irrigation schemes. According to Oakland, the Ethiopian “land rush” is part of a global phenomenon that has seen around 200m ha of land leased or sold to foreign investors in the past three years. The sales in Africa, Latin America and Asia have been led by farm conglomerates, but are backed by western hedge and pension funds, speculators and universities. Many Middle East governments have backed them with loans and guarantees. Barbara Stocking, the chief executive of Oxfam, which is holding a day of action against land grabs on Thursday, called on the World Bank to temporarily freeze all land investments in large scale agriculture to ensure its policies did not encourage land grabs. ‐ and please note that many believe the Indian companies act simply as straw‐men for USAmerican land‐grabbing interests Incl. AGRA and Monsanto), who are competing now with similar Chinese interests in Africa. In the harsh Ogaden region of Eastern Ethiopia, impoverished ethnic people are being murdered and tortured, raped, persecuted and displaced by government paramilitary forces. Illegal actions carried out with the knowledge and tacit support of donor countries, seemingly content to turn a blind eye to war crimes and crimes against humanity being committed by their brutal, repressive ally in the region; and a deaf ear to the pain and suffering of the Ogaden Somali people. Meanwhile the Ethiopian GIBE III dam project is devastating the lives of remote southern Ethiopian ethnicities. Pastoralists living in the Omo valley are being forcibly relocated, imprisoned and killed due to the ongoing building of a massive dam that shall turn the region into a major centre for commercial farming ‐ mostly by foreign ventures. War is in the making. Since mid‐November 2015, large‐scale protests have again swept through Oromia, Ethiopia’s largest region, and the response from security forces has again been brutal. They have killed countless students and farmers, and arrested opposition politicians and countless others. Since then Ethiopia has been shaken by a global wave of anti‐government protests over the controversial “Addis Ababa Integrated Development Master Plan” https://en.wikipedia.org/wiki/Oromia_Special_Zone_Surrounding_Finfinne , which is just another form of grabbing land from the Oromo people. The regime had insisted on escalating its violations of human rights through the implementation of this very dangerous policy of land grabbing in Oromia. While the Oromo people were peacefully protesting against the unfair land use policy at least over 180 innocent Oromo civilians were killed in the three months from mid November 2015 to mid January 2016. 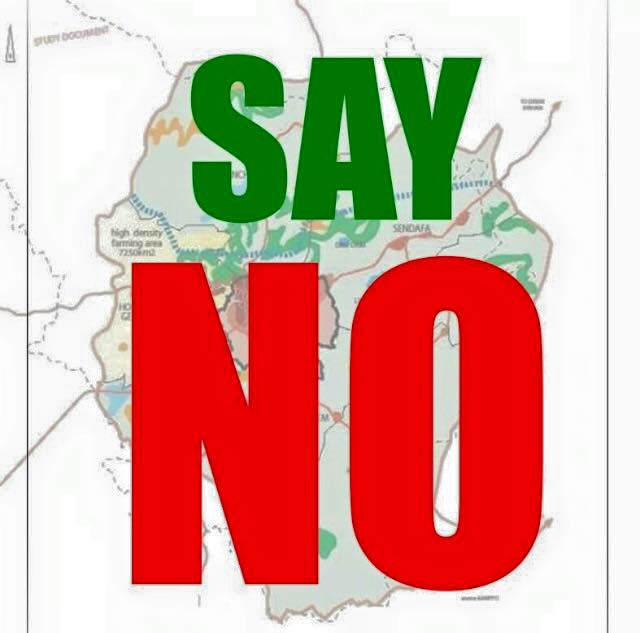 After two months of global protests, the Ethiopian government finally announced the cancellation of this development plan https://www.oromiamedia.org/tag/finfinne‐master‐plan/ for Addis Ababa (Finfinne) http://www.ohchr.org/Documents/Issues/IPeoples/WG/IGFM1‐oromo‐4b.doc and its expansion into neighbouring Oromia state. But the problem hasn’t gone away. In violation of the EU resolution and despite international pressure, reports are confirming now that the regime’s loyal armed forces continue to attack the civilian population in many parts of Oromia. Though these violations of civil rights during the process of land grabbing have reached a new climax, the capacity of human rights organizations to access data of extra‐judicial killings and disappearances in the region is at an unprecedented low. There is a war of ethnic cleansing officially declared against the Oromo people and implemented across Oromia. Though it has been difficult even to keep up with reports of the death toll some confirmed records are now showing that more than 400 civilians have been killed as of 19. February 2016. This rein of state terror must end! On January 12, 2016 the Ethiopian government announced it was cancelling the master plan, but that hasn’t stopped the protests and the resultant crackdown. Although the protest was initially about the potential for displacement, it has become about so much more. Despite being the biggest ethnic group in Ethiopia, the Oromos have often felt marginalized by successive governments and feel unable to voice their concerns over injust government policy. Oromos who express dissent are often arrested and tortured or otherwise mistreated in detention, accused of belonging to the Oromo Liberation Front (OLF), a group that has long been mostly inactive and that the government designated a terrorist organization. The government is doing all it can to make sure that the news of these protests doesn’t circulate within the country or reach the rest of the world. Of recent the Ethiopian Government has even resorted to use their Cyber‐crime Act to treat bloggers as terrorists. Ethiopia’s allies, including governments in the region and the African Union, have largely stood by as Ethiopia has steadily strangled the ability of ordinary Ethiopians to access information and peacefully express their views, whether in print or in public demonstrations. But they should be worried about what is happening in Oromia right now, as Ethiopia — Africa’s second most‐populous country and a key security ally of the US — grapples with this escalating crisis. Last week, Vision of Humanity issued its 2017 Global Peace Index (GPI). Its report on Ethiopia is certainly the most distressing though unequivocal, straightforward and clear-cut. The state of peace worsened in Ethiopia more than any other country in sub-Saharan Africa, and arguably the rest of the world. For someone who is completing his second decade of unrelenting and unwavering struggle for human rights and peaceful change in Ethiopia, the GPI report is heartbreaking and mournful. Reading between the lines is my profession. When I read the words “the state of peace has worsened in Ethiopia more than any other country”, I know what exactly what that means. I know what the opposite of the absence of civil peace is. When the state of civil peace in Ethiopia is in such dire and grave peril, the unthinkable becomes more real by the day. I want to think only about civil peace in Ethiopia. Nothing else. I dream of peace and brotherhood and sisterhood among the diverse people of Ethiopia. Peace with equality and justice for all. Peace and understanding without force. Peace offerings among all people of Ethiopia. Peaceful resistance. I believe when the power of love overcomes the love of power, Ethiopia will know peace. In this commentary, I review the latest findings of the various indices on Ethiopia. Peace is a many-splendoured thing. What do the “Indices” have to say about Ethiopia? Is there hope for peaceful change in Ethiopia? Last week, Vision of Humanity issued its 2017 Global Peace Index (GPI). 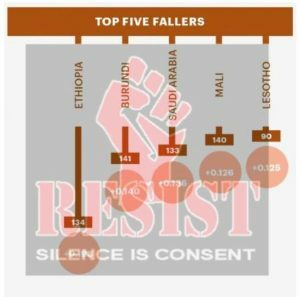 Ethiopia was #1 on the list of “Top Five Fallers”, followed by Burundi, Saudi Arabia, Mali and Lesotho. GPI provides “a comprehensive analysis of the state of peace in the world”. Simply stated, the state of peace is in its most precarious and risky state in Ethiopia. I have been warning for some time that the black apartheid system set up by the Thugtatorship of the Tigrean People’s Party (T-TPLF) has set Ethiopia on a trajectory to civil war. (That is the 600-pound gorilla in the room few dare to talk about openly.) That is why the GPI report is so worrisome and painful to me. It gnaws at my own deep concerns and anxieties about the current state of peace in Ethiopia. In my April 9 commentary, I warned that unlike the masters of apartheid in South Africa who made peace in the nick of time, time to make peace in Ethiopia is running out fast for the T-TPLF. In my commentary in The Hill last month, I urged passage of the pending human rights bill in the U.S. Congress because “Ethiopia is at a tipping point” now. It is clear what the tipping point is. It is that point of no return. Ethiopia is ranked 15th failed state out of 178 on the Failed States Index (FSI) and is rated as “High Alert”. It is #1 on the list of “Most Worsened Country in 2017” in terms of “susceptibility to instability” and “fractionalization and group grievance”. Ethiopia is ranked 108 out of 176 countries on the Corruption Perception Index (CPI). Ethiopia ranks 174 out of 188 countries on the U.N. Human Development Index (HDI). The adult literacy rate in Ethiopia is 49.1 percent. Government expenditure on education (as % of GDP) is 4.5. Expected years of schooling (years) is 8.4. The population with at least some secondary education (% aged 25 and older) is 15.8. The pupil-teacher ratio, primary school (number of pupils per teacher) is 64. The primary school dropout rate (% of primary school cohort) is a mind-boggling 63.4. The Economist Intelligence Unit’s Democracy Index (DI) scores 167 countries on a scale of 0 to 10 based on 60 indicators. The indicators are grouped into five different categories measuring pluralism, civil liberties, and political culture. Ethiopia scores 3.73 on the D.I. and is classified as “authoritarian”. 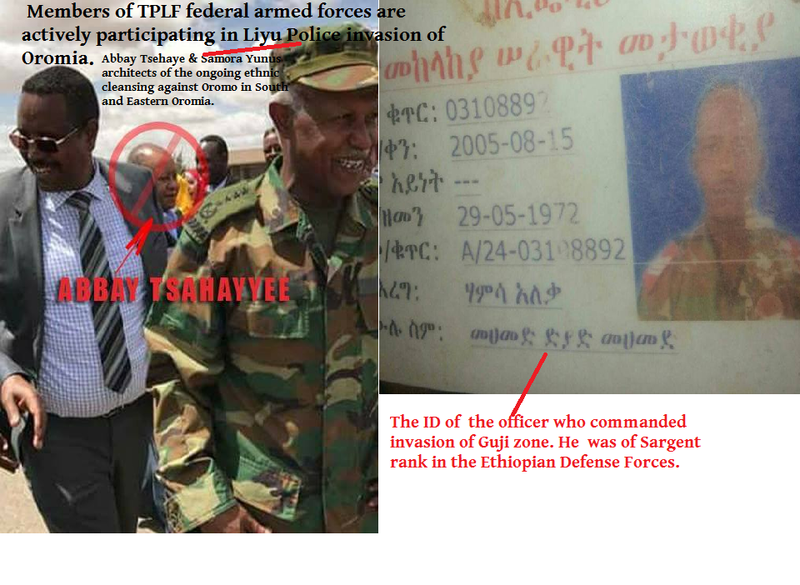 The T-TPLF is an absolute dictatorship which clings to power by an emergency decree. Ethiopia is classified as “Least Free” on the EFI with a score of 5.60 out of 10. Ethiopia ranked 145 out of 159 countries. Ethiopia was classified as Least Free on the DI because Ethiopians have little economic freedom when they acquire property. They are often subjected to the use of force, fraud, or theft in property acquisitions and there is little protection from physical invasions by others. Countries that enjoy high levels of economic freedom manifest “higher average income per person, higher income of the poorest 10%, higher life expectancy, higher literacy, lower infant mortality, higher access to water sources and less corruption.” Because Ethiopia has low levels of economic freedom, it scores very low on measures of literacy, life expectancy and infant mortality. Ethiopia is in the rump of the Bertelsmann Stiftung Transformation Index (BTI). On “Political Transformation”, Ethiopia scored 3.23 (113 out of 129 countries). On “Economic Transformation” Ethiopia scored 3.86 (109 out of 129 countries) followed by 3.48 on the “management index” (108 out of 129). Official results show that the governing-party coalition under the leadership of the Tigray People’s Liberation Front (TPLF) secured a 99% majority in the 2010 polls. The increased incidence of government land-grabbing activities – the lease of land previously used by smallholders and pastoralists to foreign investment and agrobusiness companies – has prompted heavy unrest in Gambela, in Oromo and other regions. In the western Gambela region, as many as 70,000 people have been forced to move as a result. Women’s rights are protected by legislation, but are routinely violated in practice. The national parliament (in which the opposition parties held just a single seat during the period under review) is regarded as a rubber-stamp institution, without any influence on decision-making processes within the EPRDF, the sole ruling party for 24 years. The government maintains a network of paid informants, and opposition politicians have accused the government of tapping their telephones. It is therefore unrealistic to expect that elected parliamentarians can freely and fairly participate in law-making. Ethiopia does not have an independent judiciary with the ability and autonomy to interpret, monitor and review existing laws, legislation and policies. Access to fair and timely justice for citizens, at least as conventionally defined by legal experts, cannot be said to exist. In general, there are no judges able to render decisions free from the influence of the main political-party leaders, despite these jurists’ professionalism and sincerity. The independence of the judiciary, formally guaranteed by the constitution, is significantly impaired by political authorities and the high levels of corruption. High-level judges are usually appointed or approved by the government. The judiciary functions in ways that usually support the political stances and policies of the government. Pro-government bias is evident in political and media-freedom cases, as well as in business disputes. Officeholders who break the law and engage in corruption are generally not adequately prosecuted, especially when they belong to the ruling party (EPRDF). In some cases, “disloyal” civil servants are subject to legal action. Corruption remains a significant problem in Ethiopia due to the lack of checks and balances in the governing system. EPRDF officials reportedly receive preferential access to credit, land leases and jobs. Although the political system consists formally of an elected parliament based on (unfair) competition between several parties, Ethiopia must be regarded as a “facade democracy.” The legally elected institutions are in fact part of an authoritarian system that does not offer citizens a free choice between competing political parties. Since 2005, the government has harassed and imprisoned political opponents, journalists and members of the Muslim population. In the Freedom in the World Index, Ethiopia received an aggregate score of 12/100 (0=least free; 100=most free). Ethiopia ranks 174 out of 185 countries on the MPI. According to MPI, life expectancy in Ethiopia is 64.6 years. The expected years of schooling is reported at 8.4 years. Ethiopia has a Geni coefficient of 33.2. The Gini coefficient is a measure of inequality in society. (A Gini coefficient of zero expresses perfect equality, e.g. where everyone has the same income; and a Gini coefficient of 1 (or 100%) expresses maximal inequality among values). On the gender development index, Ethiopia scores 0.842 and ranks 174/185. The Ethiopian population living below the poverty line ($1.90 per day) was reported at 35.3% for 2005-2014. The Ethiopian “population in severe multidimensional poverty” is a staggering 67%. On the Freedom on the Net Index, Ethiopia’s overall score is 83/100 (0=most free; 100= least free). Ethiopia is one of the least connected countries in the world with an internet penetration rate of only 12 percent, according to 2015 data from the International Telecommunications Union (ITU). On obstacles to internet access, Ethiopia received a score of 23/25; limits on content 28/35 and violations of users rights 32/40. Ethiopia ranked 150/180 with a score 50.34 on the RWBI. Ethiopia received a total score of 86/100 (0=Most Free, 100=Least Free) on the PHFP. On the “legal environment” of the press, the score was 29/30. On “political environment”, the score was 38/40. Ethiopia was the second-worst jailer of journalists in sub-Saharan Africa. Ethiopia’s media environment is one of the most restrictive in sub-Saharan Africa. The government of Prime Minister Hailemariam Desalegn continues to use the country’s harsh antiterrorism law and other legal measures to silence critical journalists and bloggers. As of December 2016, Ethiopia was detaining 16 journalists, making it the fifth-worst jailer of journalists in the world and the second-worst in sub-Saharan Africa, after Eritrea. In addition to the use of harsh laws, the government employs a variety of other strategies to maintain a stranglehold on the flow of information, including outright censorship of newspapers and the internet, arbitrary detention and intimidation of journalists and online writers, and heavy taxation on the publishing process. What is the price of peace in Ethiopia? Will Ethiopia go the way of peace thorugh atonement and reconciliation or take the path of civil war and bloodshed? So, whether the future of Ethiopia will be decided by dialogue, persuasion and talking to each other or in a civil war is entirely in the hands of the T-TPLF. Ethiopians united can never be defeated!!! The time for peace, dialogue, persuasion and talking to each other in Ethiopia is NOW. Human Right Council Ethiopia Releases Report On Rights Abuses Committed Under Current State Of Emergency. Human Rights Council (HRCO) Ethiopia, a non-profit, non-governmental organization, has released 49 pages of report detailing widespread human right abuses committed by the security under the current State of Emergency, first declared on Oct. 08, 2016, and extended by four more months in March 2017. In the report, which was originally published on May 29th, but was largely unseen due to the week-long nationwide internet blackout, HRCO documented details of abuses, including extrajudicial killings, torture, and imprisonment committed in 18 Zones and 42 Woredas of three regional states: Oromia, Amhara and Southern Nations, Nationalities and People’s Region (SNNPR) states as well as abuses committed in ten different Kifle Ketemas(administrative unites) in the capital Addis Abeba. Finfinnee (Addis Abeba) , June 12/2017 – The year 2016 placed Ethiopia on major newspapers across the world including Financial Times, and Washington Post as well as major broadcast media outlets such as the BBC and Aljazeera all due to the persistent, widespread and escalating anti-government protests that engulfed the country. The question many asked was “Why are Ethiopians protesting?” Ethiopians were protesting mainly because of, to refer to a July 2001 research by Acemoglu, Johnson and Robinson: “state and private predation”, (not to be confused with lack of good governance or corruption); state violence; and repression of democratic rights. Given the yearlong protest and the government’s response to it, it is imperative to analyze Ethiopia’s political instability in an already unstable region. Many political analysts assert that Ethiopia is experiencing an alarming level of political instability that will intensify the instability in the Horn of African region. In this article, I will use a political instability forecasting model developed by Goldstone et.al (2010) to assess the situation in Ethiopia. Goldstone et.al (2010) model is distinguished by its accuracy, simplicity, and policy implications. The model accuracy is impressive, exhibiting 80 percent accuracy in predicting the onset of political instability with a two-year lead time. It is unique in the sense that its policy implication – that is, political institution reform – is both within reach in the short term and the least costly option for national and international communities. The model is simple in its specification, too, and it uses only four variables in estimation. The four explanatory variables are infant mortality, conflict in neighboring states, political and economic discrimination, and regime type. Where does Ethiopia stand along these four independent variables? The first variable of interest is infant mortality rate. Over the past twenty years, Ethiopia has made great progress in reducing infant mortality rate compared to the rest of Sub-Saharan Africa (SSA). According to this data from the World Bank, in 1990, Ethiopia’s infant mortality rate was 121.6 while SSA’s was 108.5; in 2015, Ethiopia’s number was 41.4 while SSA’s was 56.4. One can say that Ethiopia’s performance on this front is truly impressive. The second variable is whether the country is located in conflict-prone neighborhood. Ethiopia shares borders with six countries: Somalia (1640 km), South Sudan (1299 km), Eritrea (1033 km), Kenya (867 km), Sudan (744 km), and Djibouti (342 km). Based on data from the Center for Systemic Peace’s Major Episodes of Political Violence, Ethiopia is situated in a neighborhood ravaged by prolonged conflict. Somalia, which shares the longest border with Ethiopia, has suffered an ongoing civil war since 1988 that claimed the lives of more than 117,000 Somalis and led to the migration and displacement of hundreds of thousands of its people. South Sudan, which shares the second longest border with Ethiopia, has gone through a devastating civil war (1998-2014) and an ongoing ethnic violence with a loss of 16,000 lives. Eritrea (part of Ethiopia until its succession in 1991-2) experienced war with Ethiopia itself from 1998-2000, a war, which, by many estimates, cost the lives of more than 70, 000 on both sides. Kenya, a relatively stable country, has been subject to spurts of ethnic violence between 1991 and 2008, costing 4,300 lives. And it is estimated that the 1983-2002 ethnic war in Sudan had claimed the lives of nearly one million Sudanese; and the recent ethnic violence (2011-2014) has claimed 4,000 lives. Djibouti’s civil war (1991-1994) had also led to the death of 1,000 people in the tiniest Horn of African nation. It is clear, then, that Ethiopia is surrounded by countries characterized by recurring ethnic violence and civil war. There is a need to analyze this “neighborhood factor” in Ethiopia by incorporating four other factors that significantly increase the impact of a “bad neighborhood” on political stability. First, Ethiopia itself is marred by its own civil war. Its struggles with Oromo separatists (1999-2000) and ethnic violence among the Somali and Oromo people (2007-2014) have resulted in the death of thousands. Second, Ethiopia is directly involved in either peace-keeping missions (in the case of Darfur in Sudan and Somalia) or in conflict (in the case of Somalia and Eritrea) which have separate implications in several neighboring countries. Third, the prolonged nature of the conflicts in these neighboring countries and within Ethiopia itself add another dimension. Finally, different ethnic groups affected by ethnic violence or ethnic wars span across all the region’s borders (Somalia, Djibouti, Kenya, South Sudan, and Eritrea), increasing the risk of political instability. In addition to the minorities subjected to political and economic discrimination, the Political Instability Task Force (PTIF) has identified possible target groups of genocide and politicide in Ethiopia, including supporters of the Oromo and Somali secessionists (2001, 2005 and 2011) and the people of Gambella (2005) and Anuak (2005, 2011). The last variable of interest is regime type. Ethiopia had a partial democracy with factionalism from 1995-2000 but then transitioned to a partial autocracy from 2005-2014. The country’s score worsened in terms of executive recruitment, dropping from a 7 (transitional/restricted election) to a 3 (designation). This suggests that executive recruitment is not competitive, but rather closed to contestation. The second component, competitiveness of political participation, has remained factional since 1995. It is evident that the relationship among political elites has not improved in the last 20 years, and the political sphere in the country remains exclusive. In Ethiopia, once again, mothers, fathers, sisters, brothers, cousins, aunties, uncles, grannies and grandads have painlessly perished under the rubble of rubbish dump landslide in the outskirt ghetto of the capital. Once again, one of the darkest days repeated in different form on a different segment of the society. Once again, the peoples of Ethiopia are mourning for the tragic death of several dozen, in addition to ongoing execution of the Oromo and the rest peoples of Ethiopia by terrorizing TPLF’s security apparatuses under its draconian State of Emergency; death of Ogaden Somali people who’re left to die from preventable Cholera epidemic; and the ongoing suffering of Gambella children who’re routinely abducted by the foreign forces and the civilians who are killed by the said invaders without the protection of TPLF’s authorities who call themselves government. The PAFD’s member originations, on behalf of their respective nations send their deepest and heartfelt condolences to the families of such tragedies. We know that there is no accountable government or institution to be held into account; although we never stop pushing with our demand for the TPLF’s regime to be held responsible. We’ve also learnt that, hundreds have been left homeless when their substandard and dilapidated houses, which they call it, a home has been buried under tons of negligently dumped garbage landslide. TPLF’s regime has ignored a repeated advice of the experts to do something about the garbage, preferring to focus on executing civilians instead. 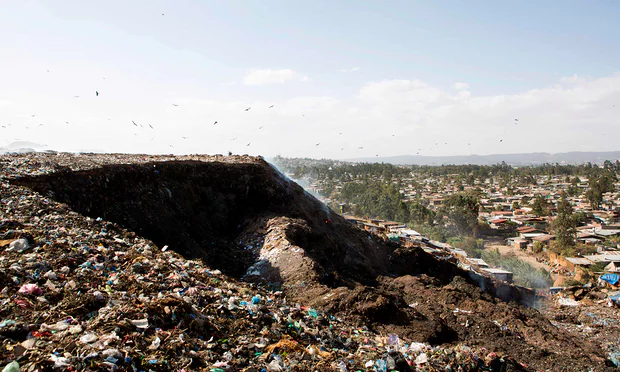 Therefore, the death of more than 68 people in the said landslide at a huge garbage dump on the outskirt of the Ethiopian capital (Finfinnee/Addis Ababa) on the night of March 11, 2017 is, a clear case of dereliction of duty by the Ethiopian TPLF’s dictatorial regime. 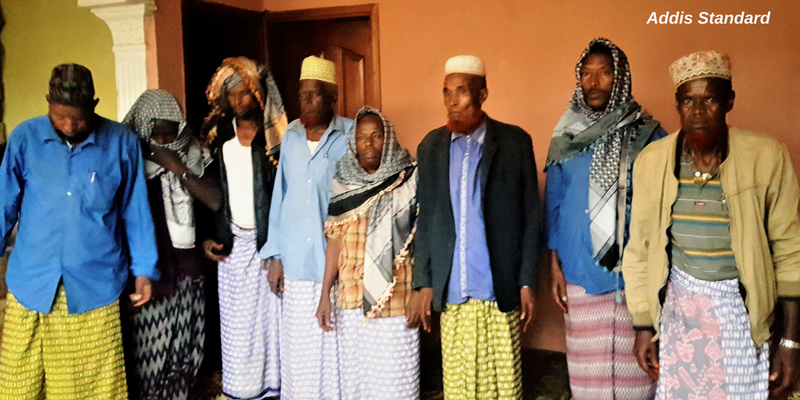 Further reports also indicate that, several dozen are still missing; and the subjects are said to be some of those who have been neglected by the ruling TPLF/EPRDF in the last 26 years of its reign; whereas the rest of the victims were some of those who have been uprooted from their ancestral lands from the outskirts of Fifinnee (Oromia) to vacate it for TPLF’s generals and politicians to trade with their lands under pretexts of investment. In either case, however, the regime in power is responsible. The subjects are ended up with such brutish and unforgiving death. We, in PAFD are deeply touched with such unsettling incidents mainly affected the subjugated and disregarded groups of society by the regime in power. We urge the peoples of Ethiopia to stand hand in hand and support the victims during such harrowing process of transition to their contexts of normality. Meanwhile, the regime in power must be wholly condemned for failing to provide the citizens with the elementary protection in the outskirt of the capital from where it exploits their resources without regards to their safety and wellbeing. 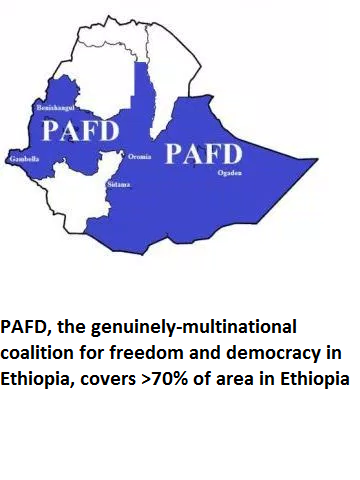 The PAFD also urges all nations and peoples of Ethiopia to unite in fighting the brutalizing regime to bring about genuine change in Ethiopian politico-economic and social landscape thereby to be able to stop such negligence of unrepresentative TPLF’s government who has proved its inaptness in the last 26 years. Finally, the TPLF’s dictatorial government must be held into account for its failure to protect the citizens; urged to unconditionally compensate the families of this tragic incident for negligently causing the death and destruction of their lives and livelihoods. May the soul of those who have died and are needlessly dying due to TPLF’s deliberate negligence and because of the ongoing operation of security apparatuses all over the country rest in peace. The PAFD never rests until justice prevails on behalf of all its stakeholders and the rest of subjugated peoples of Ethiopia. Scuffles break out in Ethiopia as bereaved families accuse rescue workers of delays after rubbish collapse kills scores. The amount of American financial aid received by Ethiopia’s government since it took power: $30 billion. The amount stolen by Ethiopia’s leaders since it took power: $30 billion. Mr. Steinman advises foreign democracy movements. He authored the novel “Money, Blood and Conscience” about Ethiopia’s secret genocide. In what could be an important test of the Trump Administration’s attitude toward foreign aid, the new United Nations Secretary-General, António Guterres, and UN aid chief Stephen O’Brien have called on the international community to give the Ethiopian government another $948 million to assist a reported 5.6 million people facing starvation. Speaking in the Ethiopian capital, Addis Ababa, during the recent 28th Summit of the African Union, Guterres described Ethiopia as a “pillar of stability” in the tumultuous Horn of Africa, praised its government for an effective response to last year’s climate change-induced drought that left nearly 20 million people needing food assistance, and asked the world to show “total solidarity” with the regime. Ethiopia is aflame with rebellions against its unpopular dictatorship, which tried to cover up the extent of last year’s famine. But even if the secretary general’s encouraging narrative were true, it still begs the question: Why, despite ever-increasing amounts of foreign support, can’t this nation of 100 million clever, enterprising people feed itself? Other resource-poor countries facing difficult environmental challenges manage to do so. 1. The amount of American financial aid received by Ethiopia’s government since it took power: $30 billion. 2. The amount stolen by Ethiopia’s leaders since it took power: $30 billion. The latter figure is based on the UN’s own 2015 report on Illicit Financial Outflows by a panel chaired by former South African President Thabo Mbeki and another from Global Financial Integrity, an American think tank. These document $2-3 billion—an amount roughly equaling Ethiopia’s annual foreign aid and investment—being drained from the country every year, mostly through over- and under-invoicing of imports and exports. Ethiopia’s far-left economy is centrally controlled by a small ruling clique that has grown fantastically wealthy. Only they could be responsible for this enormous crime. In other words, the same Ethiopian leadership that’s begging the world for yet another billion for its hungry people is stealing several times that amount every year. America and the rest of the international community have turned a blind eye to this theft of taxpayer money and the millions of lives destroyed in its wake, because they rely on Ethiopia’s government to provide local counterterror cooperation, especially with the fight against Al-Shabab in neighboring Somalia. But even there we’re being taken. Our chief aim in Somalia is to eliminate Al-Shabab. Our Ethiopian ally’s aim is twofold: Keep Somalia weak and divided so it can’t unite with disenfranchised fellow Somalis in Ethiopia’s adjoining, gas-rich Ogaden region; and skim as much foreign assistance as possible. No wonder we’re losing. The Trump Administration has not evinced particular interest in democracy promotion, but much of Ethiopia’s and the region’s problems stem from Ethiopia’s lack of the accountability that only democracy confers. A more accountable Ethiopian government would be forced to implement policies designed to do more than protect its control of the corruption. It would have to free Ethiopia’s people to develop their own solutions to their challenges and end their foreign dependency. It would be compelled to make the fight on terror more effective by decreasing fraud, basing military promotions on merit instead of cronyism and ending the diversion of state resources to domestic repression. An accountable Ethiopian government would have to allow more relief to reach those who truly need it and reduce the waste of U.S. taxpayers’ generous funding. Representative, accountable government would diminish the Ogaden’s secessionist tendencies that drive Ethiopia’s counterproductive Somalia strategy. But Ethiopia’s government believes it has America over a barrel and doesn’t have to be accountable to us or to its own people. Like Mr. Guterres, past U.S. presidents have been afraid to confront the regime, which even forced President Barack Obama into a humiliating public defense of its last stolen election. The result has been a vicious cycle of enablement, corruption, famine and terror. Whether the Trump Administration will be willing to play the same game remains to be seen. The answer will serve as a signal to other foreign leaders who believe America is too craven to defend its money and moral values.